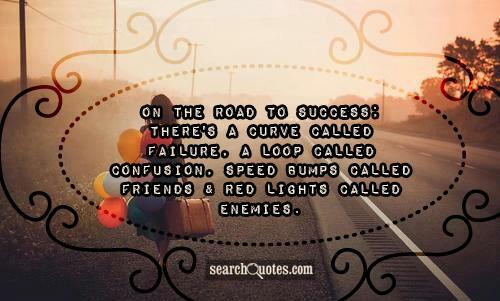 On the road to success; there's a curve called failure, a loop called confusion, speed bumps called friends & red lights called enemies. For some reason when we grow up, it seems as if society teaches us that if we win, everyone will love us, and that we will receive kind attention and recognition for all of our accomplishments, but when it comes to human relations and emotions, the reality is that we will often seem to have more enemies. Though life is definitely always what you make out of it, there are some things that you can't control, including and especially the feelings of others, and the way that they perceive your blessings and victories. We have to remember as well, we should go out of our way to be kind to our enemies, and to always let those who may not like or agree with us, that we are beings full of love and that you are focused on a mission that you honestly believe and know in your heart to be God's will for your life. Though there will be people who come against you, you have to remember to keep focused on your dreams instead of another persons senseless hate.